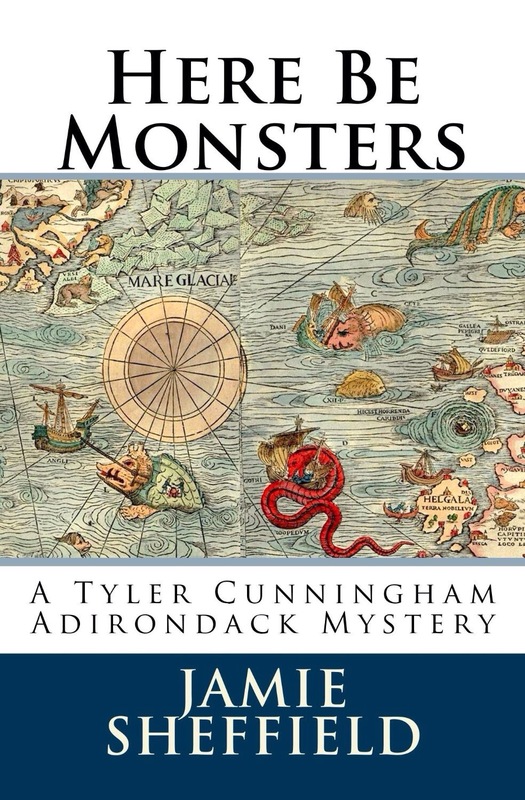 Today we have Jamie Sheffield, author of the Tyler Cunningham Adirondack Mystery Series, featuring one of the most interesting protagonist I’ve ever read. Let’s hear about Jamie’s writing process. I live in the Adirondack Park in Northern New York with my wife and son and dogs, in a small house in a big forest. Although I dream of writing full-time, my current “day-job” is as a Special Education teacher in Lake Placid, NY. I love camping and canoeing and reading and cooking and travel. 2. How do you choose names for your characters? I build my characters based on combinations of people that I know or read about, and generally crunch their names around enough to make them not instantly recognizable, but still close enough that I can hold onto the feeling of the people I used. 3. Do you talk about your book/characters as though they are real? I do, because by the time I get to/through the writing stage, they are real to me, and I know how the will act and react in a given situation. 4. Do you listen to music when you write or edit? What kind? I listen to classical music when I write … generally one of three playlists: The Goldberg Variations, a mellow Mozart mix, or classical guitar with Segovia and King. I like the music to occupy some parts of my brain and drown out distracting ambient noise, but not to grab my full attention (which is why I don’t write to music with lyrics). 5. How long have you been writing? I’ve been serious about my writing since the summer of 2012; before that, I always did some writing, but could never commit to longer writing projects. 6. Tell us about when you realized you were ‘meant to be’ a writer. I’ve always felt that I was meant to be a writer, but never felt that I had the time or ability or staying power to start and finish a novel. I remember writing stories when I was in primary school, and loving the narrative process. 7. Do you have a muse? It will embarrass her to read this, but my wife is my muse. Stories come to me (from wherever they come) and I shape and craft and polish them with her in mind. She’s my target audience, and every story I tell is written for her to read and enjoy; knowing this pushes me to write the best stories I can. 9. Writing quirks or superstitions? I don’t know if it’s superstition, but I’m a big believer in NaNoWriMo. The month-long writing sprint helped/allowed me to write my first novel, and I’ve gone back to use it every summer since to write the subsequent novels. I can’t imagine writing my books in any other way now, although I write all sorts of shorter fiction and poetry during the rest of the year. 10. Tell us about your current work-in-progress. I’m working on a number of things right now: a lengthy piece (pieces) of serial fiction, a young adult fantasy story (I don’t know yet if it will be a novella or a novel), and I’m in the early stages of planning my next novel for this summer. 11. What book are you reading now? I tend to read a bunch of books at once, switching around based on my mood. I’m also an unrepentant re-reader, circling back to books I’ve enjoyed in the past; I’m always pleased to find that I can find new things to love in almost any book. 12. What genre do you write in? What about POV? I generally write in the mystery or crime or thriller neighborhoods. To date, just about everything I’ve written is first person; which makes me want to try writing from another point of view. 13. Tell us about writing preparation. Character Profiles? Outlines? 14. Do you know how your stories will end? I tend to know, in broad strokes, how my stories will end, but the specifics and details often end up surprising me as I write them in the first draft … they also sometimes get altered after my beta-reader takes a look at the rough work. 15. Do you books have a message or theme? Or are they purely for entertainment? Although I write my books for entertainment (both mine and my readers’), when they’re done, I generally find that they reflect/impart some moral (or immoral, or amoral) message/lesson that I have worked through in the process of exploring the landscapes of the book with my protagonist. 16. Do you have any favorite snacks or drinks that you eat/drink while writing? I drink lots of coffee (black and sweet and large and strong, like my dogs, Miles and Puck) and Coke while I’m writing; I try to find and maintain a sweet-spot on the caffeination curve, somewhere between wired and vibrating (I find that some of my best writing comes when I’m amped enough to disconnect just slightly and my unconscious takes the reins just a bit). I like neat and easy snacks while I’m writing … bite-sized and not requiring a napkin or keyboard clean-ups. cut up fruit and cheese and meat is my favorite, and I tend to break to make a plate every couple of hours. 17. Tell us about your other passions. I love nerdy electronics (GPSrs and ereaders and watches). I enjoy exploring new and interesting places … foreign travel, abandoned buildings/towns, unique modes of travel, etc.. I’m very interested in advances in science and technology and the environment. I have lots of fun trying out new foods and recipes. I care deeply about animals in general, and shelter dogs most particularly, and spend lots of time walking dogs at our local shelter. 18. What’s something interesting about you? There was a period right around when I turned forty that I went camping every single month for more than three years (I still go camping a number of times every year, in all seasons, in a camping hammock). 19. Share a small sample(limit to one paragraph, please) of your writing… can be a WIP or already published. There was a gentle glow coming on in the sky to my right as I drove north through the cold and empty beauty of the Adirondack Park. I would have pointed the impending dawn out to the girl in the back of my Element if she wasn’t unconscious and bleeding on the easy-to-clean floor. I crossed the northern border of the Park at the same time that the sun crept over the white pines on the side of road. I don’t know if that first ray of morning caught her eye, but my passenger groaned, cleared her throat a bit to try and speak, then clacked her teeth hard together again to hold back whatever she was starting to say. I consulted the map in my head, determined that I wouldn’t make it to the house before she started acting up, thought about Murphy’s Law and the prevalence of state troopers on backcountry roads for only a moment, and then pulled over to deal with Sadie Hostetler. 20. Anything you’d like to say to your current and future readers? 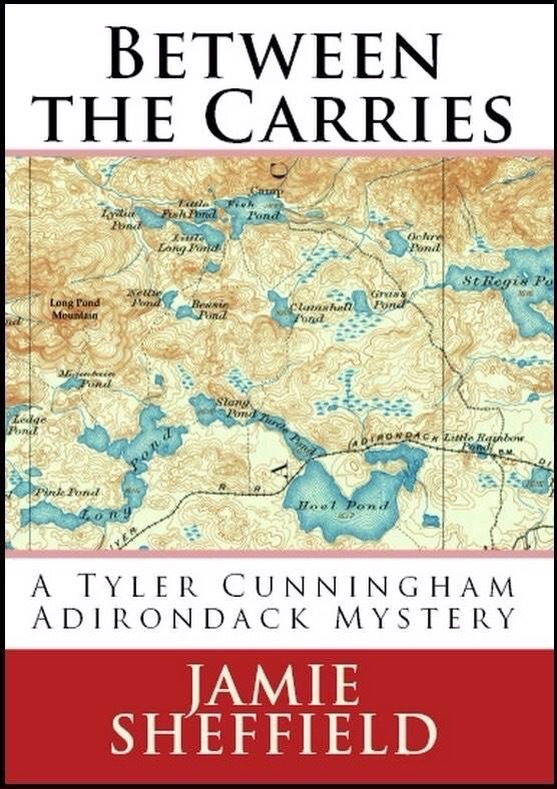 I’m excited about the recent release of my third, and latest, novel, “Between the Carries”. It dovetails nicely with the previous books, and also with the novellas. I have a great time writing these books, and as much fun talking with people who’ve enjoyed them. I am working on a bunch of other writing projects currently, but am on track to write the next Tyler Cunningham adventure this summer, and can’t wait to share it with everyone early in 2016! Thanks Jamie!! We enjoyed reading about your approach to writing. Good luck with Between the Carries. 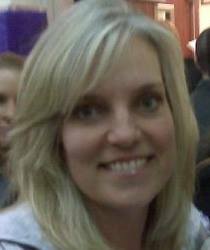 Today’s feature is Jennifer Sadera, author of “Flawless.” Let’s read about her writing process. I am a curious person. Okay, my kids would call me nosy, but, really, I’ve always liked to know how people are feeling, and what they’re thinking. The best way to learn about them is to ask questions. So, I’m always asking questions. Once I get answers, I mull them over in my mind, to figure out exactly what they mean, or to determine if they’re truthful. Much of this forms the basis of my writing. How I choose names for my	characters: Three “baby name” books, baby! The meaning of names is vital to character development. For instance, my main character in FLAWLESS is named “Lia,” which means, “weary one.” That tells a lot about what she’s up against in the novel, don’t you think? I don’t talk about my characters as though they are real people. I am very protective of them, and their stories, and I’m always put off a bit when people refer to them as if they are my friends. My husband has done it a few times, and it always catches me up short. Also, I don’t want to “push”	them onto others. I want readers to WANT to meet them, and develop their own relationships with them. I am deeply committed to the notion that I AM NOT my writing, and my writing is not me. I feel that if I cannot separate myself from the writing, I’ll never be able to handle critiques. Everything will become too personal. I never listen to music when I write or edit, but often lyrics or poems run through my mind of their own accord, and usually weave their influence into my stories. This week, the late poet, Matthew Arnold, keeps visiting me in the form of his work, “Dover Beach.” I especially love the last stanza! I’ve been writing since the age of 8. My first “novel” was written in a spiral binder. It was called “Shekel,” and was about a girl who found a magic gold coin. 6. Tell us about when you realized you were ‘meant to be a writer. I think I’ve always known on a deeply subconscious level that I was meant to write. It took many years for my conscious mind to agree, and even longer for me to lose the fear of trying. Eventually my faith became greater than my fear, because I just wanted it so badly!!! It was only when I TRULY DIDN’T CARE what others thought that it all worked out for me. I have a muse: the natural world around me. I have but to look around to become inspired. 8. How do you improve as a writer? The best way for me to become a better writer has been to become a better reader. Being the most excellent reader I can be has helped me immensely, as well as enriched my life. There is so much to learn and share! I read every day, and still I feel the lack of not reading enough. Other things I have done to improve: I took a class with an established author, who not only gave me valuable insight, but introduced me to other writers who were just as helpful. I attended a writer’s conference, where I met up with an literary agent who encouraged me. I have no writing quirks or superstitions. I simply know that what will flow each day, will flow. Like all else in this world–good and bad–my writing unfolds as it was meant to. For that reason I don’t need to depend on anything else. And I never get writer’s block! 10. Tell us about your current work-in-progress? My current writing project is a New Adult novel titled ANONYMOUS CLUB, about four young woman who meet at an AA meeting. The twist: none of them are alcoholics. So what are they doing there? This story is a departure for me,	because I tend to write long, sweeping, emotional novels. This entire story takes place in the span of one day. It’s a challenge	for me, and I’m excited about it. Right now I am reading “My Brilliant Friend,” by the Italian author, Elena Ferrante. My first published book, FLAWLESS, straddles the fence between New Adult and Women’s Fiction, and has been referred to as a “dark contemporary,” which I think is fitting. Since publishing it just over a year ago, I have written a straight-up Women’s Fiction novel titled, TENDING PARADISE, which is in the hands of my (hopefully—fingers crossed) soon-to-be agent, and I am now starting on the aforementioned ANONYMOUS CLUB, a New Adult novel. I write in first-person P.O.V because I	love the immediacy of it. The characters become so accessible to the reader. 13. Tell us about writing preparation. I do a lot of prep before I begin a book. It starts on long car rides and in the shower, when I have time to just think, think, think. Then I write down everything I’ve	thought about. I write detailed descriptions of each character,	including physical and mental details, as well as quirks. Then I	outline the entire book in a “sun” pattern. I put the main character(s) in the center of the sun, and shoot out “rays,” each one representing a chapter. I can’t do the organized (translation: boring) outlining that I learned in middle-school English Composition. I tend to think visually, and natural themes/organic symbols help me organize my thoughts into workable forms. I always know how my stories will	end. 15. Do your books have a message or theme? Or are they purely for entertainment? I always have a message and theme	to my novels, and this is why: we’re all just bopping around on this planet trying to find meaning in our lives, and figure out where we fit in, how we can contribute, and if we’re “good enough.” These are universal things we all experience to some degree. I feel like exploring it helps us make sense of the whole jumbled mess. I try to make sense of it with my questions and my observations. Then I relay what I’ve learned through my writing. I often feel like words are all I have to give, but I give them all up for a greater good. I drink coffee and tea nonstop when I’m writing. And if there’s chocolate in the house, it will	also become my constant writing companion. For that reason it is seldom in the house!!! My other passion in this life is the natural world around me: my family, and nature. I am also a horticulturist, and that love came through in my second novel, TENDING PARADISE, which is a story about loss, love, and the tangled vines of family. It’s a poignant, but uplifting (I hope) story of a woman, marred by tragedy, who hides from the world in her opulent estate and gardens. Sort of a “Terms of Endearment” (without the terminal illness) meets “The Secret Garden.” My husband and I built a pond by hand in our back yard, and I value each and every frog who visits. I also treasure the sound of birdsong on the wind. I’ve explored and shared my love of the natural world on my weekly gardening blog, GreenGardenGuru.blogspot.com. Something I’ve not shared before about myself is this: I was once a fitting model in New York City. After I graduated from college, I moved to the city and took modeling assignments (as well as waiting tables at a comedy club) to pay my outrageously expensive rent on Manhattan’s upper west side. My experiences helped form the core of some of the designing scenes in	FLAWLESS. They also helped me work through the conflicted feelings	I’ve had about inner and outer beauty, and how we use appearance to feel valuable. It’s a fascinating theme to me, and one I explored in the novel. 19. Share a sample of your work. In this story, Lia’s flawless, an object of worship. And hated. And, more than anything else, she just wants everyone to leave her the	hell alone. I hope it begs the question: why? I hope readers want to find out. The last, and most important, thing I’d add is this: write and read from a place of truth. Writers, put it all out there–with no fear. Your truth is real, and important. It helps people understand their own lives better. And readers, be true to your core values when reading. There are a	lot of books out there, and only a limited amount of time to read them. Don’t waste time with something that doesn’t rock your world. Toss it and try something else. 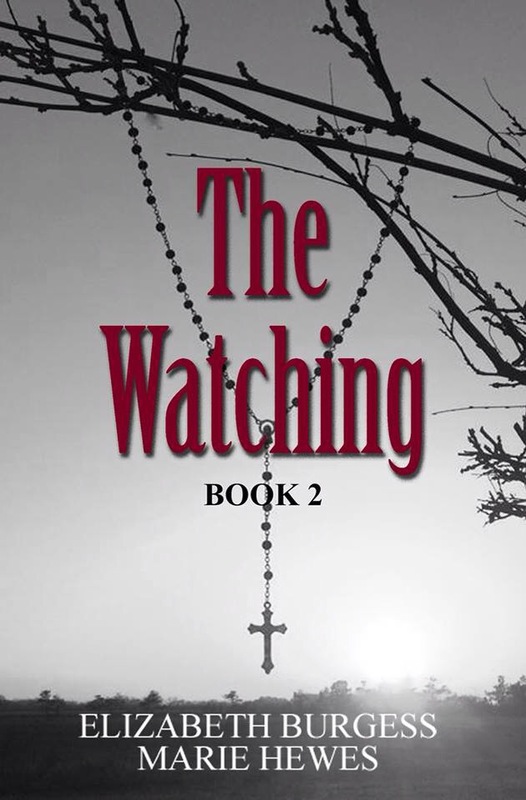 The cover of The Watching has been a challenge for me, to say the least. I always have an idea in my head of what I want these covers to look like based on the entire story. Whatever the reader sees on the outside needs to represent the inside, and until yesterday, that hadn’t happened. After numerous ‘scouting’ trips, including a day trip to New Orleans to photograph cemeteries, this little picture was taken right outside our door. I’m a married empty-nester; my three children left home years ago and now all have three children of their own. Two boys and one girl each, how coincidental is that?! My husband’s name is John and we live in Australia’s national capital, Canberra, also referred to as the Bush Capital. It’s a lovely place surrounded by low mountain ranges. Our house backs on to a native reserve and we often have kangaroos outside. Out front we have a view of the Brindabellas, our local mountain range, and sitting on the loungeroom deck with a coffee or wine in hand, depending on the time of day, is a guaranteed soul soother. Our oldest daughter lives in the UK and we spend time there every year. I talk about my professional life in another question so I won’t repeat it here. And I’ve included links at the end of the interview. They tend to just pop into my head. Sometimes I’ll have several jiggling around for top spot but I’m mindful of them fitting the person. There’s a funny story about the main male character in IMBROGLIO. His name is David Cameron. I wrote the first draft before the actual David Cameron became the UK PM but, you know, it never occurred to me that my David had the same name. It was only last year when a UK reviewer pointed it out that I had that forehead slapping moment. Not to other people, no. But do I talk to my characters? Yes. We have a very honest and open relationship; we can say anything to each other. Writing their stories wouldn’t be possible otherwise. And after their stories are told they don’t leave; they get on with their lives and let me know what they’re up to. I need total quiet to stay inside my head. My 30+ year career was in publishing in the Australian federal govt public service. I worked across the publications, public relations and media fields. I did a lot of writing but was principally an editor. I’ve been fiction writing for that long as well. I don’t know that I’d couch it in quite that way but I’ve always liked telling stories and am happiest when I’ve got one percolating. And as far as being a professional writer and editor is concerned, I always said that if I had to work it was the perfect job. I have a very understanding, tolerant and patient husband. He’s indulged my need for writing time ever since we got together. Does that count as a muse? Years ago when I realised I needed feedback on my fiction I did a university night course which led to a Bachelor of Arts degree in Professional Writing and then a Post Graduate Diploma in Communication. I’ve also been a member of community writing groups and writing organisations and participated in writing master classes. Nowadays it’s having my manuscripts critiqued and beta read. Another way to improve is through reading. I’m a committed reader and I review most of the books I read. I believe that writing a considered review is a good way to hone your analytical skills. I’m also a professional editor; that’s another terrific way to hone analytical skills in relation to what makes good writing. No superstitions but maybe a quirk. I guess I’m an anomaly as a writer. With digital publishing most authors seem to write very quickly and publish everything they write as soon as they’ve finished it. I don’t. My first three novels went into the fire; I viewed them as practice while I was trying to find my genre. I discovered it with my fourth and fifth novels and those are the two that I’ve published to date. I’m also very slow to publish; I put what I think is the final draft in a drawer for at least a year and don’t look at it until I’ve forgotten most of the detail. That way when I look at it again I’m reading it afresh. It’s amazing how the deficiencies jump out. Consequently I have only two published novels to date as well as a short story compilation and a writing guide. My third novel. The draft has been in a drawer for years. I’ve delayed pulling it out for the last two years while getting set up on Amazon and social media as well as getting my website and blog up and running. Amazing how time consuming all that has been. But I’m now going to delay it again to write a three-book series based on a jewellery theft. I was in Italy in July/August 2013 for my daughter’s wedding and had all of my jewellery stolen. I was traumatised to say the least. I’ve always known I’d turn it into a story one day and now’s the time. Renaissance 2.0 by Dean C Moore. He’s an indie author and I’ll be reviewing the book when I’ve finished. I write contemporary fiction. 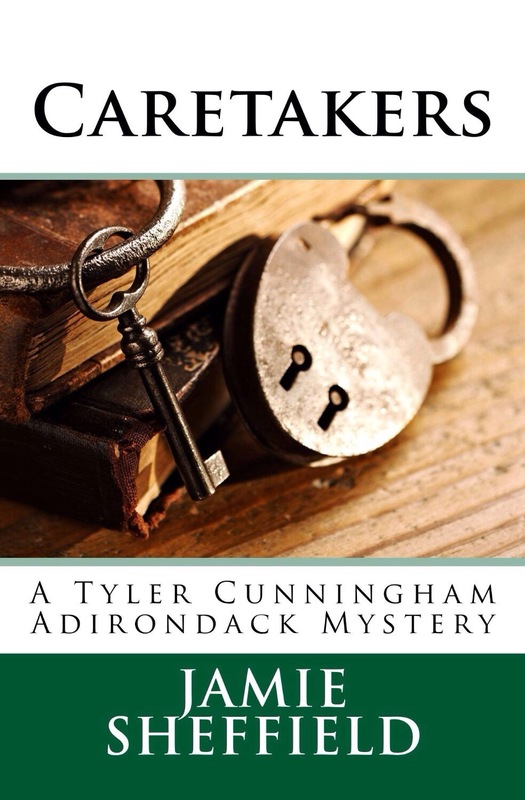 It’s also been tagged as thriller, mystery, intrigue and literary. My preferred POV is 3d person omniscient. My third novel is 3rd person single. That needs a bit of vigilance to ensure I stay in it! It’s easy to stray. It depends on the story line. With AUTOMATON I had the outline and main characters in my head before I started. When I began to write it the detail and secondary characters just happened. With IMBROGLIO there are two main characters whose stories run concurrently so I mapped out their days on a chart and filled in what they were doing in side-by-side columns. That way I knew what each was up to at any given time. When I set out I think I do. But that can change, depending where the characters take the story. All books have a theme, but not necessarily a message. Both of my published novels are themed and there’s a message in each if the reader looks. But over-ridingly they’re for entertainment. One that’s on the drawing board will buck that trend as it will have a message no-one could miss. But that’s a couple of years away from being written. No snacks because I put weight on too easily. But continual tea and coffee. Constant sipping seems to fuel the flow. Travelling is one. My oldest daughter and her family live in the UK (I’m in Australia), so John and I visit her every year. We combine it with other adventures; in 2013 before going to Italy for her wedding we did the UK Coast-to-Coast walk. It took us 18 days and we loved it. This year we’ve been seeing a bit of Australia. Just after Easter we toured the bottom end of Western Australia, and in October we toured around Tasmania and climbed Cradle Mountain. That was a feat worth mentioning! Whatever I say here is going to sound contrived, silly or immodest. I’ll go for immodest. My first published novel AUTOMATON won best Australian self-published fiction in 2003 and was nominated by Sisters In Crime for the Davitt awards in 2004. 19. Share a small sample (limit to one paragraph, please) of your writing… can be a WIP or already published. Here’s the opening to AUTOMATON. It wasn’t his appearance that unnerved her, unexpected though it was with its neat new track runnelling the middle of his chin, curving through cheek and across the outer corner of his right eye to disappear into the hairline. It wasn’t even that they were alike in colouring and delicacy of features. It was his expression. A mixture of hope and no hope. He was red-haired, fresh smooth skinned, freckled with a faded tan, 19, and not far from the trial of his life. Don’t leave me in a vacuum! Let me know what you think of my stories. Reviews are treasure, but so too are the personal emails. You can contact me via my website contact page. Receiving them makes my day. Actually, it’s more like my week. And I always have time to write back. Thanks Alana! We’re glad you shared with us today! With no way to reach civilization, being rescued is Aimee and Tristan’s—the pilot—only hope. A slim one that slowly withers away, desperation taking its place. Because death wanders in the jungle under many forms: starvation, diseases. Beasts. 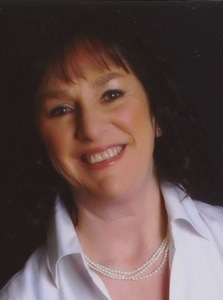 My name is Layla Hagen and I am a Contemporary Romance author. 2. I like writing in airports and planes, which has led to a number of embarrassing events (because writing steamy scenes in crowded planes can have only this one outcome). 4. I get ideas when I am stuck in the most boring situations. I think it’s my brain’s way to cope. 5. Movie soundtracks also get my creativity flowing. Funnily enough though, I can’t listen to music when I am writing. I need silence. 6. On that note, I also get ideas after I watch a movie. They are always completely unrelated to the movie I’ve just seen. Weird, huh? 8. I love Christmas so much that I will often keep the tree until the end of January. After that, I still keep Christmas lights in my house for about a month. 11. Though I have a series titled „Lost“ and „Withering Hope“ is about a plane crashing in a remote location, I have never actually seen the TV series Lost. Seeing it is very high on my to-do list though, especially since I adore Ian Sommerhalder. 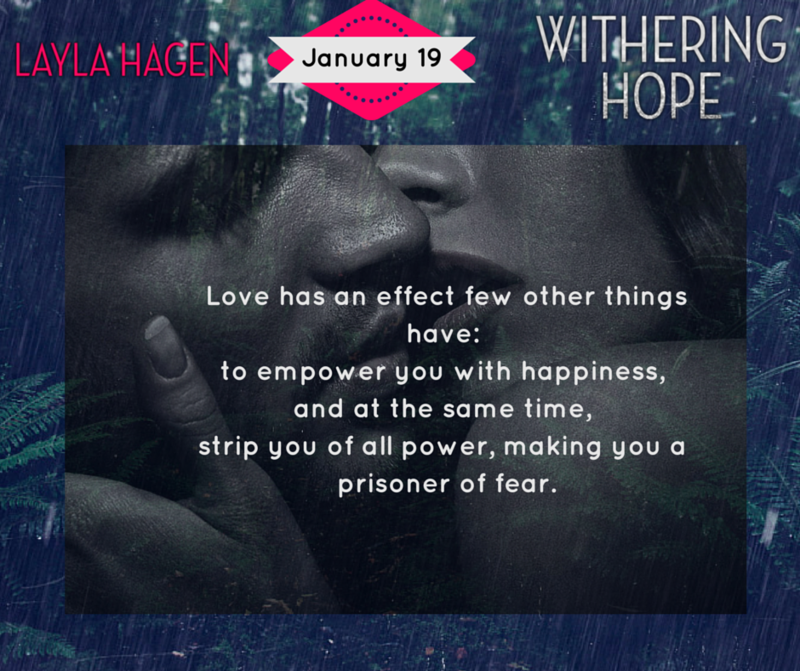 This was my first book to read by Layla Hagen, and I was more than impressed. First off, the overall concept of the book…crashing into the Amazon rainforest – genius. I can only imagine how much research went into her location and learning about survival in a place off the grid. Secondly, the characters…well-developed and fleshed out. Raw, real, and heart-wrenching. The culmination of their feelings was expected, and had the author done it any other way, it wouldn’t have been right. 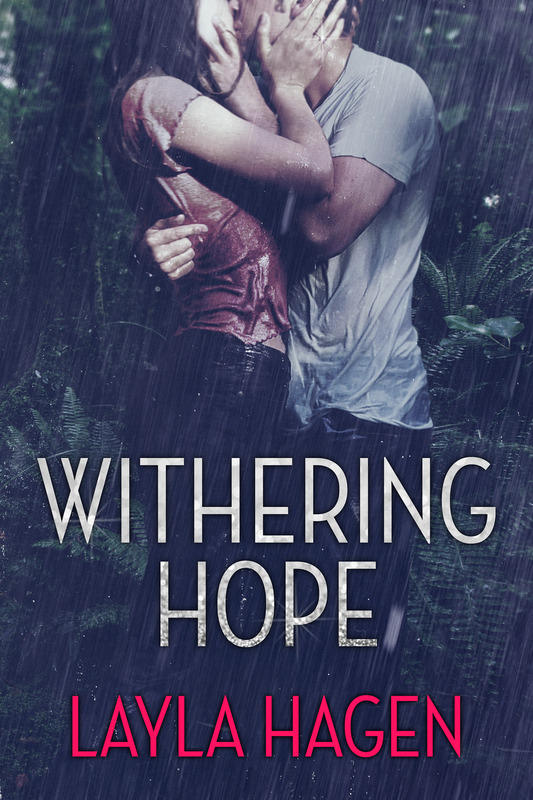 Withering Hope is one of those books that you may have to read twice, because your flipping pages SO fast to find out what happens that you miss important details that make Tristan and Aimee’s story that much more endearing. 5 exciting stars! I wake up covered in cold sweat and something soft that might be a blanket. I can’t tell for sure, because when I open my eyes, it’s dark. When I try to move, a sharp pain in my temple makes me gasp. “Tristan.” The word comes out almost like a cry. In the faint moonlight coming in through the windows, I see him leaning on the seat in front of me, hovering over me. I imagine his dark brown eyes searching me worriedly. “Just my temple, but I’m not bleeding,” I say, running my fingers over the tender spot. I assess him next. It’s difficult given the dim moonlight. His white uniform shirt is smeared with dirt, but he appears unharmed. I turn my head toward the window. I can’t gauge anything outside in the darkness. I nod, trying not to let the tight knot of fear in my chest overtake me. If I let it spiral out, I may not be able to control it. “You got out?” I whisper. “I want—” I say, opening my seatbelt and trying to stand. But dizziness forces me back into my chair. “How will they find us?” I curl my knees to my chest under the blanket, the dizziness growing. I wonder when Tristan put the blanket over me. “Can contact someone at base?” I ask weakly. “No. We lost all communication a while ago.” His shoulders slump, and even in the moonlight, I notice his features tighten. His high cheekbones, which usually give him a noble appearance, now make him look gaunt. Yet instead of panic, I’m engulfed in weakness. My limbs feel heavy. Fog settles over my mind. “What happened to the engine?” I whisper. “No.” As if in a dream, I feel Tristan put a pillow under my head and recline my seat. No rescue helicopter arrives. Not the following morning, or any morning after it. I expect Aimee to break down, but she doesn’t. It shouldn’t surprise me, though. I’ve suspected she is strong since I first met her. fresh start I so desperately needed. I was grateful to him, and even liked him. Despite his wealth and success, he was grounded and unpretentious. 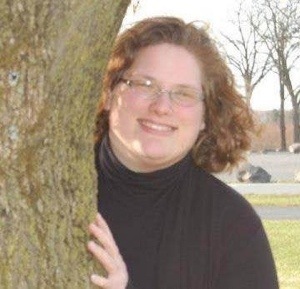 When I first met Aimee, I was pleasantly surprised to learn that she was just as unassuming. She went out of her way to be friendly, making it easy to adjust to my side job as her driver when Chris didn’t need me as a pilot. I suppose I came off as cold to her, because I only acknowledged her effort with a curt thank you. But I wasn’t used to anyone being friendly to me. Over the past years people had either shown me pity or feared me. Not Aimee. Of course, she didn’t know anything about my past—Chris kept his word and never told her. When first I drove Aimee to Chris’s parents’ mansion, I realized Aimee hadn’t given me any special treatment. She was genuinely friendly to everyone on the staff. They all liked to be around her. I liked it a little too much. She had a way of growing on people without even trying. She was warm and eager to get to really know people. A bit too eager… and the secrets I carried were best left buried. So I was content with being around her, or observing her from a distance. From where it was safe. Here, where our lifeline depends on working and sticking together, where I’m prepared to do just about anything to keep her safe, it will be hard to keep that distance, but I will do my best. “Just stay with for a little while, please. I need you so much, Aimee.” The sound of my name from his mouth awakens something in me that has me writhing in a blazing torture. It’s doing things to me it shouldn’t do. “Not someone. You. You make the memories bearable, the present better. You have an unbelievably strong will to keep going, even if you don’t know where you’re heading, hoping you’ll find something worthy at the end of the road. You have an inherent ability to pick up the good on the way—those that give you strength, the happy things, like your poems—and you go on. You pass that strength onto others, even if it costs you sleep and peace. For a long moment, we are silent, our gazes locked. I breathe in his hot breaths, tension crackling in the short distance between our lips. Then he pulls me into a kiss. The touch of his lips on mine electrifies me, shimmer after shimmer coursing through my nerve endings. His tongue takes mine in a primal claim. Icy shivers splinter my skin, and at the same time, fire awakens deep within me. I’ve never been kissed like this. Ferociously, with absolute, desperate need. I try to temper the heated emotions building inside me. I try to remember it’s wrong. But that fleeting thought is drowned by the heat igniting his lips and hands, and I surrender. Tristan deepens the kiss until I’m out of breath. I become aware of his hard chest muscles, of every line and every ridge, as my hands roam wildly with a greed I don’t recognize. His hands graze my body, traveling from my back to my thighs, spreading the fire in my center; I’m convinced it will consume me. With a jolt, he pulls me even closer to him, so I’m all but straddling him. His fingers fumble with my hair, as his blessed mouth cradles mine, coaxing a whimper from me. 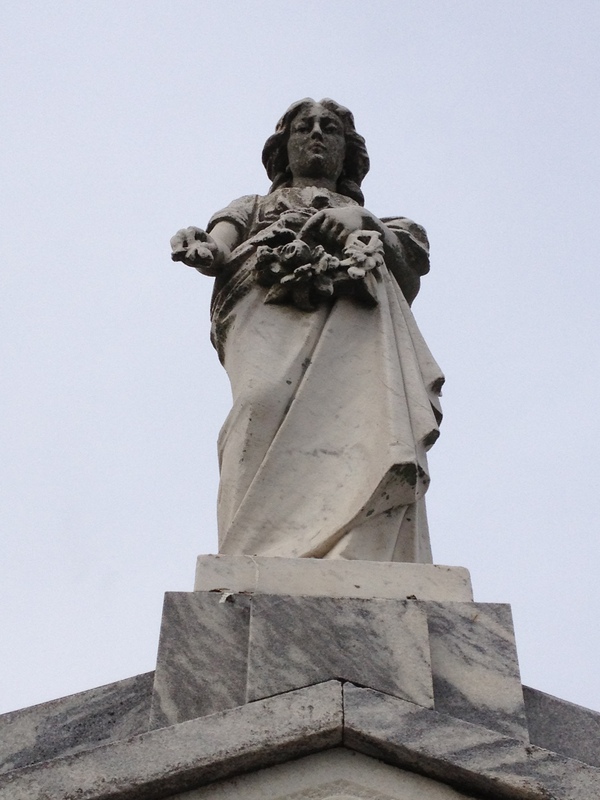 – Today’s picture is from Greenwood Cemetery in New Orleans. –The Watching is back to me for first edits from my amazing editor, Kathy. Here’s her website (http://www.indiepublications.com/) if anybody’s in need of a professional editor with affordable prices. She’ll be featured here the first weekend in February. -Speaking of The Watching… we can’t wait for y’all to read the next installment in this series. 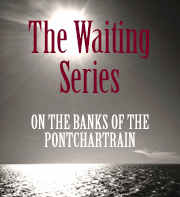 It’s filled with even more secrets from our favorite South Louisiana families. Hoping for a February release date. – I’m looking for authors for our “For Your Reading Pleasure” feature. 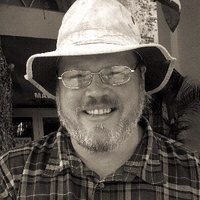 I’ve been booked since October, posting a new author nearly every Monday and Friday, and I’ve really enjoyed getting to know different writers and their processes. So… if you are a writer (published, unpublished, or aspiring) and you’d like to take your readers deeper into how you do it, then shoot an email to elizabethburgessandmariehewes@gmail.com. – The Wanting: Book 3 in The Waiting Series, FINALLY has a complete (but subject to change) outline. Initially, I thought I could do it with my tentative ‘list of things that needed to happen,’ but at the 4th chapter, it became apparent that I needed something a bit more structured. Hope y’all have a great day. Today we have Casey Fry. We’re glad to have her insights…so read on and enjoy! My name is Casey Fry. I will turn twenty-seven in April, and if that isn’t a little frightening, I don’t know what is. I live in a small town in Pennsylvania with my two cats, Tootsie and Zero. I have a full-time job and own my own business and spend my limited free time writing. I have a fondness for hot tea and chocolate, my favorite dessert is cherry pie, and my favorite season is Autumn. When I’m not working or writing, I like to draw, read, research, practice archery, and horseback ride. I enjoy traveling and recently spent some time in Salem, Massachusetts, researching for an upcoming book. Sometimes, I choose a character’s name because the meaning of the name has a connection to the story or fits an aspect of the character’s personality. Other times, it is because the name itself is a play on words. For instance, Mortimer, one of the main characters in the DeathSpeaker Trilogy, is so named because his name can be shortened to Mort, which means “death.” In some cases, the names I use were not planned but chosen because I liked them. Marissa, in Dragon Circle, came from a fondness for the name. LaRune, the book’s main character, actually gained that name due to a typing error that I was too fond of to change. Not usually. I try to keep a bit of a wall in between them and my real life, since they’re quite real to me in my head. Not when I’m editing or writing – for that, I need silence and the chance to concentrate on the words. When I’m just brainstorming or really working through how a scene will run, I often play music. Action scenes will have me listening to heavy metal or hard rock, while I’ll play duets for romantic scenes, and different genres for different scenes. It all depends on what kind of images I need in my head. Since I was very young. The first story I can remember writing was about my pet brontosaurus, who I rode through town and took to McDonald’s to buy hamburgers. When I was ten, my mom and I went to the movie theater to see Little Women. It had been her favorite book when she was little and she gave me her copy when I was young, allowing it to swiftly become my favorite. I was completely in love with the character Jo and wanted to be just like her. It was then that I decided I was going to be a writer, no matter what, and I remember I started writing a story in the car ride on the way home. I haven’t stopped writing since. Both of my parents have inspired various pieces of my stories, and my brother especially has been an inspiration for a piece of nearly all of my stories, even being the basis for certain characters. They, and some very close friends, have been great supporters and inspiration for my writing. I read a lot, and have been reading a lot since I was little. I also have my Bachelor’s Degree in Creative Writing. I haven’t been to very many workshops outside of college, or conferences, but I enjoy discussing writing with a number of other writers in groups on Facebook. I have made a number of great friends there, and have others, who help me improve simply through discussion. I also do a lot of research, and I practice a lot. Other than having a cup of tea with me when I’m working, there are no great writing quirks or superstitions that I can think of. “Never go anywhere without a pen” is probably the biggest one, and I suppose that’s been more drilled into me from school than anything. I also don’t give characters the same name as my brother or my parents. Currently, I’m working on The God Stone, the second book in the DeathSpeaker Trilogy. It continues three months after Hunt, following Mortimer as the young DeathSpeaker deals with a series of murders occurring at the monastery he is now forced to call his home. Even while he tries to survive becoming the main suspect in the deaths of the monastery’s elder priests, he is still being hunted by Hester, a vicious servant of the mysterious Master who manipulates her many minions from the shadows. The plot is later thickened by the return of a character who was thought lost in the previous book, and then the rush to reunite with Ricker, who is suffering his own troubles. Currently, I’m in the process of reading The Ruins, by Scott Smith. I saw the movie when it first came out in 2008 and stumbled upon the book at the library. I was thrilled to discover it was a book first and have been steadily devouring it. For genres, I tend to write fantasy, usually dark fantasy, supernatural thriller, and mystery. I have touched on both horror and science fiction and intend to play around with them more in the future. All of my work tends to have a fantastical or supernatural edge to it. I often write third person limited or omniscient point of view, but I have a first person point of view book in the works that will come out after the DeathSpeaker Trilogy is finished. When an idea comes to me, I usually just start out writing the bits and pieces that come to mind – moments that will occur, specific plot-points, character introductions, bits of dialogue. As I learn more about the characters and the plot unfolds, I will start with character profiles. Mine tend to be very in-depth, including everything from physical description to their parents’ names to what they plan on being when they grow up. I also work on an outline of the story, which is sometimes nothing more than a list of things that will occur, and sometimes really in-depth. It tends to depend on the story and how much there is to explain. One of the larger series I’m working on is set in the fantasy world of Senexus. Due to the need to explain how this world works, as well as the political system which rules it, I have pages of notes involving setting description, royal family trees, and a history which spans back a few hundred years. I usually have quite a hoard of notes before the real book writing begins. My biggest problem is not losing them! Not always. Sometimes I write the stories much the way that people read them – with no idea of what’s coming next. Thankfully, it’s more common for me to be aware of what’s going to happen. I have even had some moments where I am aware of the way a story will end before anything else. Due to my outlining, however, more often than not I have at least a general idea, at the start, of how things will turn out. I never start a book with a message in mind. I write books for my own entertainment and am simply glad that there are others who enjoy them, as well. Sometimes, while writing a book, I will find that there is a message or theme that has formed all on its own and I just roll with it. I have a love of hot tea that follows me throughout the day, but I almost always have a cup with me when I’m writing. Unless I’ve managed to drag myself out of bed really early to get some work done, and then I might have treated myself to a latte. 17.. Tell us about your other passions. I love to cook. I especially love making new things that I’ve never tried to make before (or even never eaten before), occasionally altering the recipe. I also like to grab whatever looks good in my fridge, toss it in a pan and see what happens. In this way, I have made quite a number of very interesting original dishes (and one really gross one that I won’t repeat). I also enjoy reading, my favorite authors being Dean Koontz, Stephen King, and JRR Tolkien. Recently, I’ve taken to raiding my local library for new books and have discovered some lovely new titles. Outside of cooking and reading, I enjoy researching random curiosities, studying mythology, and practicing archery. Writing Dragon Circle required me to research traditional archery for Marissa’s character. We had two traditional bows in the basement – a shortbow and a recurve bow – and I brought them both out to try them, see which one I preferred, and practice with it so I could write Marissa’s character knowledgably. My target was a black five gallon bucket I’d sat upside down on a hill and the first bow I chose was the shortbow. My first shot nailed my target. I didn’t even bother with the recurve bow and I’ve been addicted to archery ever since. 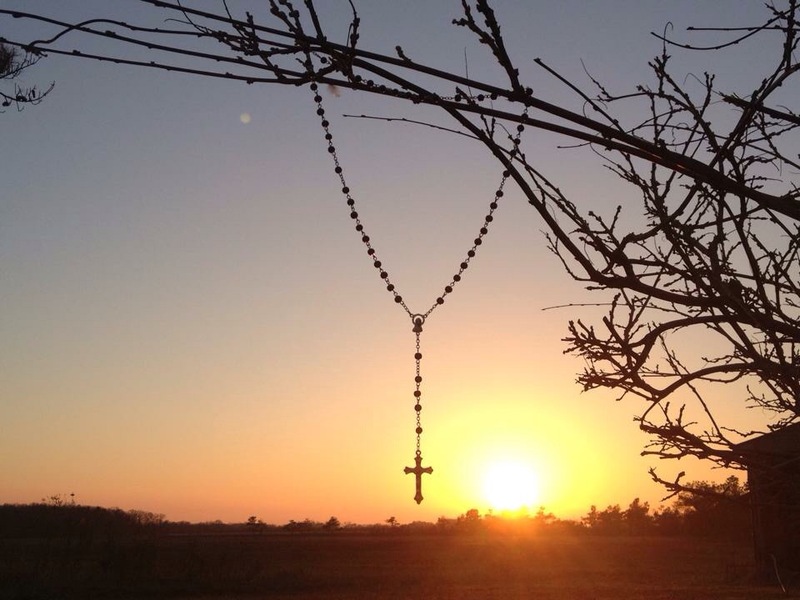 The sun was sinking below the horizon, the cracked earth darkening to the color of mud. Peter stared at the ground beneath him, feeling the heat from it, the firmness pressed against his stomach, and he didn’t allow himself to be fooled. Still, he felt the dryness of his throat, swallowed through his thirst, and thought longingly of the skin in his pack. He daren’t touch it. He’d traveled for days to get here and had used up more than half of his water supply, even while rationing. He didn’t know how he would make it back with another person in tow before they died of dehydration. Perhaps he’d let the assassin drink poisoned water. He was a DeathBreather, after all. It wouldn’t kill him. Thank you for joining me in an adventure! I hope whatever book you pick up takes you to a world you’ll enjoy visiting, and that you’ll continue to travel with me as the years go on and we discover new worlds to explore. Thanks Casey! Good luck to you!!! !